The recently published book, Understanding Quality Peace: Peacebuilding after Civil War (Routledge), is the second book in a three-part book series exploring “quality peace” as a robust concept with positive characteristics that move beyond simply the absence of war. The book is co-edited by two faculty at the Kroc Institute for International Peace Studies and Keough School of Global Affairs at the University of Notre Dame: Madhav Joshi, Research Associate Professor and Associate Director of the Peace Accords Matrix project, and Peter Wallensteen, Richard G. Starmann Sr. Research Professor of Peace Studies. 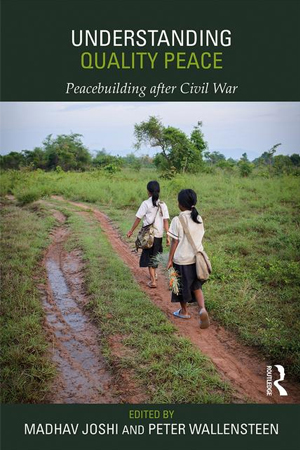 In addition to pieces by Joshi and Wallensteen, the book includes essays by 21 peace studies scholars, practitioners and policymakers reflecting on the process of peacebuilding after civil wars in a variety of international contexts. Other Notre Dame faculty contributors include Viva Bartkus, Associate Professor of Management at the Mendoza College of Business, and the late John Darby (to whom the book is dedicated), Professor of Comparative Ethnic Studies at Kroc. In addition, Kroc Institute PhD graduates, Alex Dukalskis (’13, Lecturer in International Politics and Human Rights, University College, Dublin, Ireland) and Laura Taylor (’13, Assistant Professor at the School of Psychology, Queen’s University, Belfast, Northern Ireland), also contribute a chapter. This book follows Wallensteen’s 2015 volume, Quality Peace: Peacebuilding, Victory, & World Order (Oxford University Press), which first introduced the concept of “quality peace” as a scholarly research topic. In this new volume, contributors dig deeper into five dimensions of quality piece: post-war security, governance, economic reconstruction, reconciliation and transitional justice and civil society. Writers offer case studies of peace processes in post-conflict zones including El Salvador, Northern Ireland and the Solomon Islands. Joshi and Wallensteen hope that the book will provide resources for academics, and also for peace practitioners and policymakers involved in implementing peace processes following conflict. “In the book we make the case that while all of these post-conflict societies are different in their trajectories, the path toward quality peace is an important goal and we need to know how societies are progressing toward that goal,” said Joshi. Joshi also hopes the book will bring researchers and practitioners into conversation with the Peace Accords Matrix (PAM) project, an innovative source of comparable data on peace agreements housed at the Kroc Institute. PAM allows scholars and practitioners to compare 51 different themes across all the comprehensive peace agreements signed since 1989. Joshi, along with Darby and Jason Quinn, PAM Research Assistant Professor, helped to develop the method used to track the progress of peace accords. The third volume in the series, The Peace Continuum, co-written by Patrick Regan, Professor of Political Science and Peace Studies at Notre Dame, Christian Davenport (University of Michigan) and Erik Melander (Uppsala University, Sweden), will be published in May 2018. Davenport and Melander are both former Notre Dame faculty members. About the Kroc Institute: Notre Dame’s Kroc Institute is one of the world’s principal centers for the study of the causes of violent conflict and strategies for sustainable peace. The Kroc Institute offers BA and PhD degrees in peace studies and supports the International Peace Studies concentration of the Keough School Master of Global Affairs. The Kroc Institute is an integral part of the University of Notre Dame’s new Keough School of Global Affairs. Originally published by Hannah Heinzekehr at kroc.nd.edu on March 19, 2018.